When a child is abducted (taken without the consent and authorization of their lawful parent or legal guardian) across international borders, the Hague Convention may present a remedy to the aggrieved parent or legal guardian. When a child is wrongfully removed from the Unites States or wrongfully abducted and retained in the United States from a country that is a signatory of the Hague Convention; a Hague Convention petition should be considered by the aggrieved parent or legal guardian. The aggrieved party should seek relief under the ‘return remedy provision’ of the Hague Convention. The return remedy provision mandates that a child who is wrongfully removed (or retained) is returned to her/his home country. The goal of the return remedy provision of the Hague Convention is to return the parties to the pre-abduction status of the child. That is put the child back to where the child was prior to the abduction. There are a number of defenses that can be raised to prevent a child from being sent back to (or retained in) a seriously dangerous environment. Under the Hague Convention, a child’s interest is paramount. By that I mean that the courts will inquire: Are there ‘grave risks’ that return of the child would expose the child to physical or psychological harm or otherwise place the child in an intolerable situation. See Hague Convention Article 13(b). The respondent to a Hague Convention Petition must establish by clear and convincing evidence that an Article 13(b) exception applies. If ’grave risks to the child’ is not established the Court will order the child returned. The return of the internationally abducted child to the complaining parent or guardian does not establish physical or legal custody rights. That is not the purpose of the Convention’s ‘return remedy provision’. 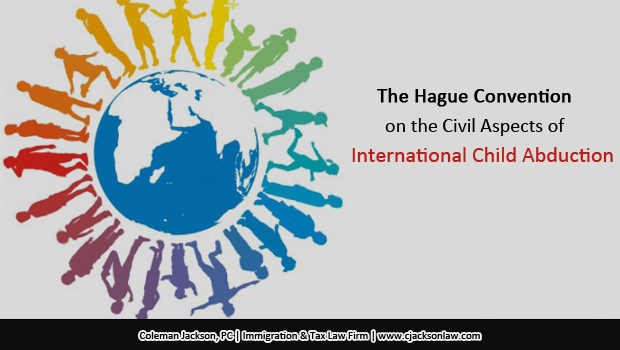 The Hague Convention is designed to allow the child’s home country the right to decide or adjudicate legal custody rights under their own laws and customs. This is designed to prevent parents or other guardians of children from forum shopping or abducting children and taking them across national borders in search of Courts in jurisdictions that are to their likening and preferences. This immigration law blog is written by the Tax & Immigration Law Firm of Coleman Jackson, P.C. for educational purposes; it does not create an attorney-client relationship between this law firm and its reader. You should consult with legal counsel with respect to any specific international child abduction issues or your particular set of circumstances impacting you or your children. This entry was posted in Family Immigration on October 29, 2015 by Coleman Jackson.